Copenhagen Historical Fencing Club is a martial arts club working on reconstructing armed and unarmed combat with roots in European history tracing back to year 1300. Our work is historically accurate and based on fencing manual research combined with modern knowledge. 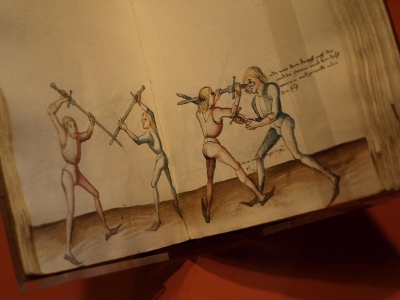 Even though the first known fencing manual dates back to the year 1300, it does not stop us from exploring further back in time by studying weapons and combat from earlier periods. Many do not know that we in Europe have a long tradition of Martial arts. Because of the pragmatig attitude in warfare these Martial arts was almost forgotten, mainly due to advancements in weapon technology. We provide a unique oppoertunity to connect with a traditional rich and historical form of training offering personal development and challenges on many levels. As a member in our club you will be part of a worldwide movement that will give you a look into unknown parts of Europes history.